Just over a month ago, The BIG School Fundraiser that I co-chaired finally happened after months and months of planning. The fantastic and fun evening was a huge success and, yes, I am totally proud. The guests had a great time and the school made lots of much needed money. We did it and we did it good. On a personal note, I pushed myself waaaaaaay beyond my usual comfort zone, set higher expectations for my work and achieved them, kept my cool during the really difficult and awful stuff (the hardest part by far! ), embraced my creative side (the best part by far! ), and stepped up to the plate when needed. I did it and I did it good. But, once the money was collected and counted, the auction items mailed, the post-event meeting finished, and the hoopla dwindled away, I was left feeling wrecked. Weeks later, I was still in fight-or-flight mode with a clinched jaw, blown out back, unsettling eye twitches, and an agonizing feeling of tense nerves and not myself at all. The way I was feeling was foreign and weird and I consciously did everything I could think of to make it better. I wanted to be myself again, dammit! I reached out to people that care, especially those that I neglected during my stressful planning frenzy, honestly telling them that I'm not doing so well and why. The human to human connectedness reminds me that I'm not alone in all this and how I am surrounded but great people. Even if I'm not myself, they still care and love me anyway. It isn't always easy for me to express that I'm struggling (have to be strong and steady like people expect! ), but it's worth it. Very worth it. Heavy emotional stress is horrible for the body and I certainly felt firsthand how devastating it can be. My chiropractor confirmed what I already knew - I was a complete mess. My body screamed out how UNHAPPY IT WAS WITH ME!!! from all of that neglect. According to Dr. David, the body doesn't know the difference between being chased by a jaguar or being under an intense deadline. Tremendous stress releases bad chemicals in the body and without proper care, they just build and build and build until the body, or in my case, my upper back, shuts down (and causes tremendous pain!). When we sweat, out body releases those awful chemicals and replaces them with endorphins and good chemicals, offsetting the stress and helping us cope and feel better. I didn't do any of that in the months leading up to the fundraiser - I just gritted my teeth and clinched my jaw and functioned in survival mode, crouching in the bushes, hiding from the jaguar - waiting for it all to be over. So, I returned to Dr. David several times, got reacquainted with the gym, I took some good sweaty walks, I worked in my garden, down-dogged in my yoga classes, and got back to taking care of my body...and in return, my soul. I've got this casual and neat hobby - collecting sea glass. It combines one of my favorite things in the whole wide world, the ocean with treasure hunting. Lucky for me, March in Southern California is perfectly lovely for indulgent beach excursions. I've ventured to the beach twice since the fundraiser ended, once by myself while the kids were in school, and another time on the weekend with a dear friend of mine and fellow sea glass collector (her extensive collection is amazing!). That day with her, I not only found my first piece of cobalt blue glass that I always long for, but I also found a lucky penny. Was that a good sign or what!? 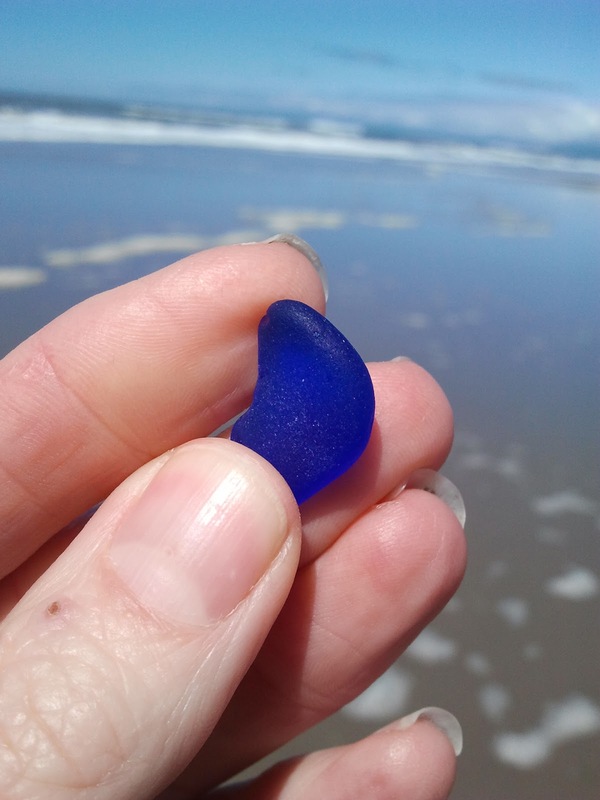 There is nothing like walking along the sparkling shore, talking about life (see #1), breathing in the salty fresh air, and finding that little desirable piece of ocean tumbled glass. Awesome! 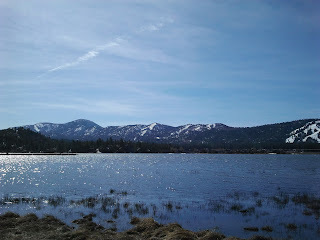 Two weeks after the fundraiser, my family took to our annual trip to the snow in the local mountains of Big Bear. We stay at the same cabin that we always stay at, go to the same quiet sledding spot away from the crowds, buy chocolate from the same sweet store, and eat at the same yummy restaurant on our last day. While some might think that's beyond boring, I find our simple traditions positively comforting. 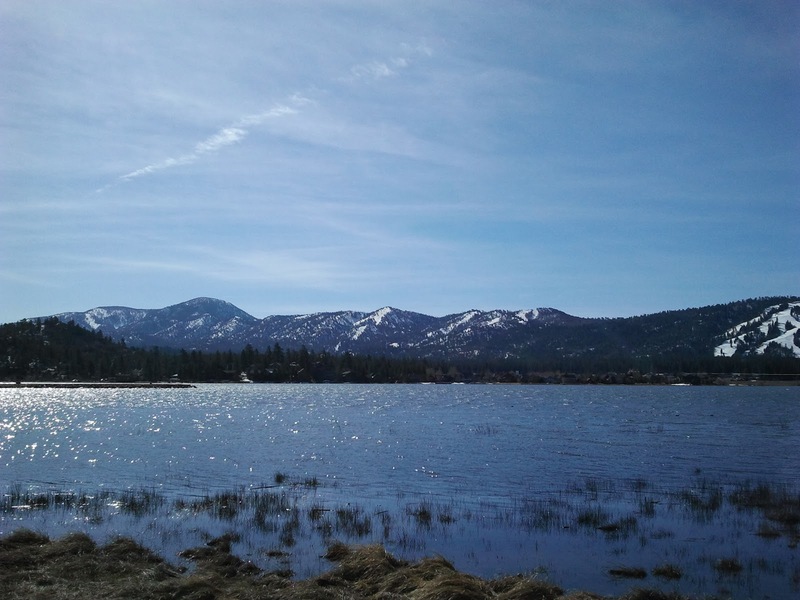 I don't have to think much - just relax and enjoy the beauty in the surroundings, happy giggly kids, and quality family time. Normally, I am rather conscious about what I eat - calories, protein, organic, fats, chemicals, etc., etc. This last month? I ate with wild abandon. Whoooo hooooo!! I savored whatever food I felt like eating and indulged without guilt or worry. Not great for the hips but completely liberating. My mom gifted me a month of art classes, uh humm, last April for my birthday, and I never cashed in the certificate until now. I felt totally guilty about this all year, like I was this ungrateful daughter who was missing out on this great opportunity. Well, I started my first class the week after the fundraiser and definitely plan on renewing after my initial four classes end. The first two classes weren't easy - uncomfortable, doubtful, and unsure. But, once I came back from the emotional wreck that I was, I walked into my third class this week with my head held high - confident and full of joy about being there. Sometimes timing is everything - I just wasn't meant to take the classes until right now when I was truly ready. The class is filled with older women who have been taking painting classes together for many many years. They are talented and kind and supporting and funny and I feel right at home. Fulfilling my long time desire to take an adult painting class and being surrounded by these wonderful women is exactly what I needed. My roots were scary - no wonder I wanted to hide in the bushes! But, my fabulous hair lady set me right with new highlights, the latest gossip magazines to read, and a wise and empathetic listening ear. Nothing like a girly day of pampering to make a lady feel better. I've always loved gardening, going back to my very early years when my family raised chickens (fresh eggs...yummm!) and lots of vegetables (yep, my parents were rather earthy). Now that I'm a grown up with my own family, I love gardening in my own backyard. A year or so ago, I made the decision to take out my existing garden bed since it was too close to the house and never did very well. Did I immediately replace it in another location? Well, sadly no, and I've missed and craved it ever since. So, the weekend after the fundraiser, I said to my husband, "Husband, it's time to build a new garden bed" and sure enough, we did it. I literally felt the urge to get grounded - to dig in the soil and plant some new beginnings. I know...corny but sooooo good for the soul. I don't like sounding cryptic, but my "tar vision" was a HUGE breakthrough and a life changer and I will never forget it. I hope to write about it soon after doing some research and...when I'm ready to share. I am beyond relieved that after my valuable "10-step therapy work", I'm finally and happily myself again. Man, was that ordeal rough! Thank goodness I didn't stay "wrecked" for too long. It's funny thing, though, as much as I feel like myself again, I feel different, too, but in a good way. I am stronger, wiser, more self-aware, and ready (and rather excited) for what's next.